Rated PG-13 for war and all its wounds and sorrow. Natalia Theodoridou is a media & cultural studies scholar currently based in Exeter, UK. She is also the dramaturge of Adrift Performance Makers (@AdriftPM). 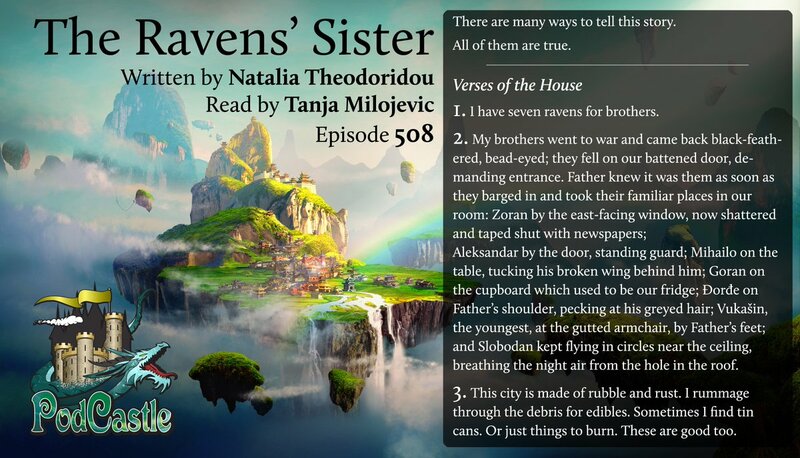 Her fiction has appeared in Clarkesworld, Shimmer, Apex, and elsewhere. Her story “Every Black Tree” is forthcoming in Beneath Ceaseless Skies. Personally I don't care for stories that keep changing the story line. First the brothers are all dead. Then they are all ghosts. Then they die individually. But not all of them. Or was the one with the broken wing still dead? In spite of my personal issues with this type of story, the imagery and narrative drew me in and kept me going. I know that outside of the ugliness of war the story told and remembered takes on many different forms, morphing over time because the truth is often too horrible. I suppose this embodies a little bit of that. The story of the girl whose seven brothers are turned into swans has always haunted me. I loved the ptsd allegory. Investigators think Pi's story is to unbelievable, so he tells them a version where all of the animals on the boat were actually all people, and the horror of the events is so much worse. As neither version can be proven, Pi asks them which version they prefer and they choose the more fantastical one with the animals. I think the different versions of the brothers' story is kind of like that. What did the sister want to believe, what did she know to be true? Which was the story she could make peace with? I had to google The Seven Ravens. Many aspects of the story made more sense after that. I had a really hard time following the formatting in audio. Popping over for the text helped me understand the point of it.